Has your relationship with your Griso grown strained? Is it time to rekindle your romance? Love grows stale, it happens. And when it does, sometimes relighting the flame is as simple as an extensive makeover and/or a long stint in rehab. Our old pal Todd Eagan has been a Moto Guzzi guru/geek since Lago di Como was a slow leak, and he is standing by waiting for your call, ready to transform your flabby old CARC-equipped (Cardano Reattivo Compatto single-sided swingarm-o) Moto Guzzi into the lithe, 396-pound supermodel sportbike of your dreams. Read all about it below. Messing with a legend is taking the bull by the horns. But that’s exactly the challenge accepted by Todd Eagan of GT MotoCycles in building the seriously stripped-down and brutally efficient GTM-01 for attacking apexes and delivering the sort of visceral thrill that unites riders, and respects both the iconic past and a unique place of Moto Guzzi motorcycles in history. The GTM-01 is the product of Eagan’s million plus miles, countless corners and a long checklist on how to construct the ideal motorcycle. Stripping away all but the most essential running gear, wrapping those in a custom Tonti-inspired frame and upgrading the electronics and running gear to modern specifications, the one-of-one GTM-01 strikes a purposeful and refined silhouette. Eagan’s background as a pro-racer, committed Guzzifile and aftermarket parts manufacturer informed this stunning thesis that would surely bring a smile to Carlo Guzzi himself. 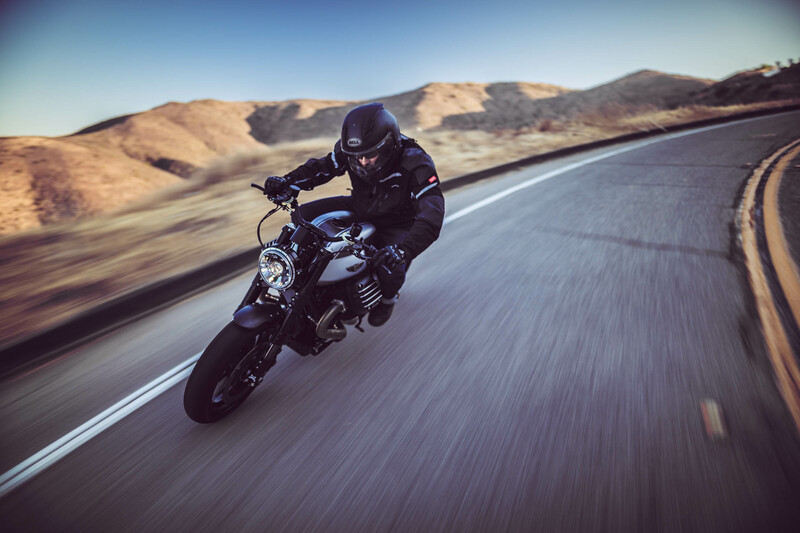 The in-house built 1380cc big bore high-output Moto Guzzi transverse V-Twin combines state-of-the-art performance into a brutally refined motorcycle. 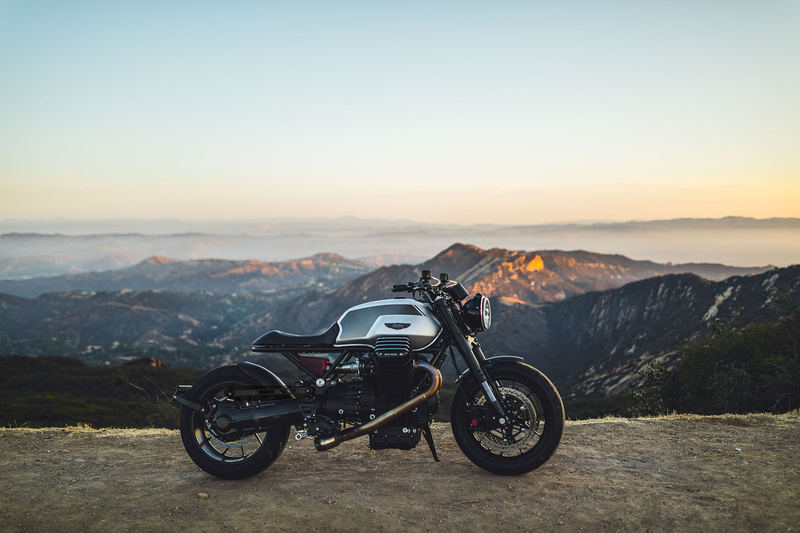 The powerplant and drivetrain at the build’s core is the proven and modern, fuel-injected, Moto Guzzi 4-valve overhead cam tranverse v-twin. Embraced by a lightened, narrowed and stiffened hybrid stock / GTM frame, which fuses the legendary Tonti big-block chassis with a modern single-sided (CARC) swingarm and monoshock. Decades of experience on customer builds and designing aftermarket parts, lead to many subtle engineering and aesthetic revisions that stiffen and strengthen the frame, without adding undue bulk. Attention to detail that will be appreciated by riders who enjoy premium products. 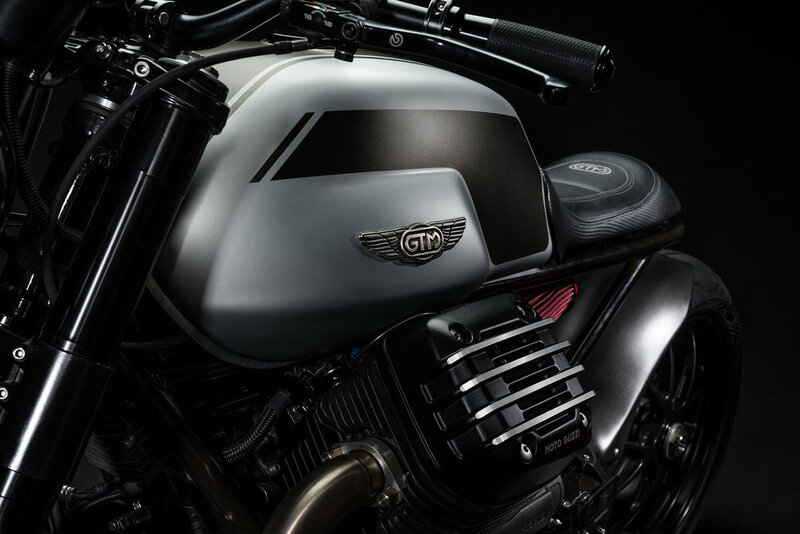 As it was being built, the GTM-01 inspired enough attention from customers and enthusiasts to create the GTM-02 bespoke production motorcycle series. The first of the complete in-house trellis frame GTM-02 production bikes shares many of the details from the GTM-01 prototype including embracing modern technology. 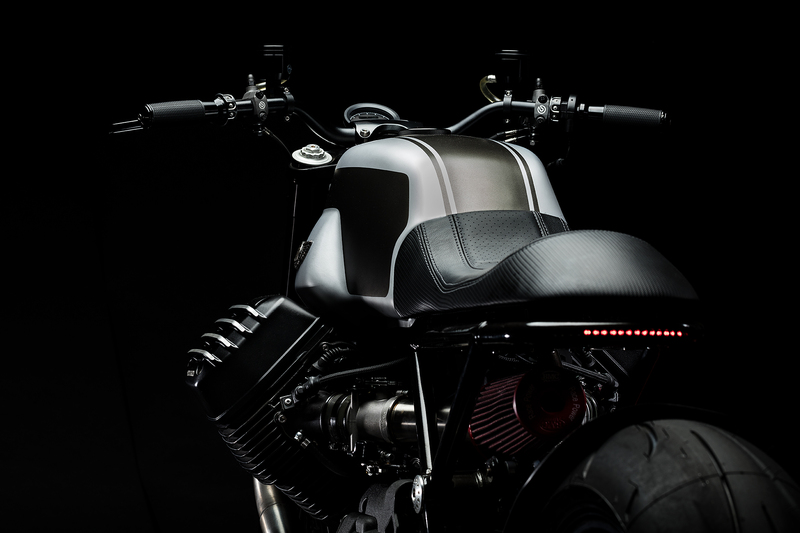 The bikes are packed with premium amenities including keyless ignition via Motogadget’s Bluetooth with m.Ride integration, a wide-beam LED headlight created in partnership with KC HiLites, minimalist wiring and a unique LED taillight and indicators integrated directly into the frame. GTM-02 frames are currently ready for customer orders. The singular GTM-01 weighs a feathery 396 lbs. without fuel and feels lighter due to the ultra-low CG, making this one lithe Goose. Experience again proves itself in the form of 140+ horsepower over a broad torque curve. 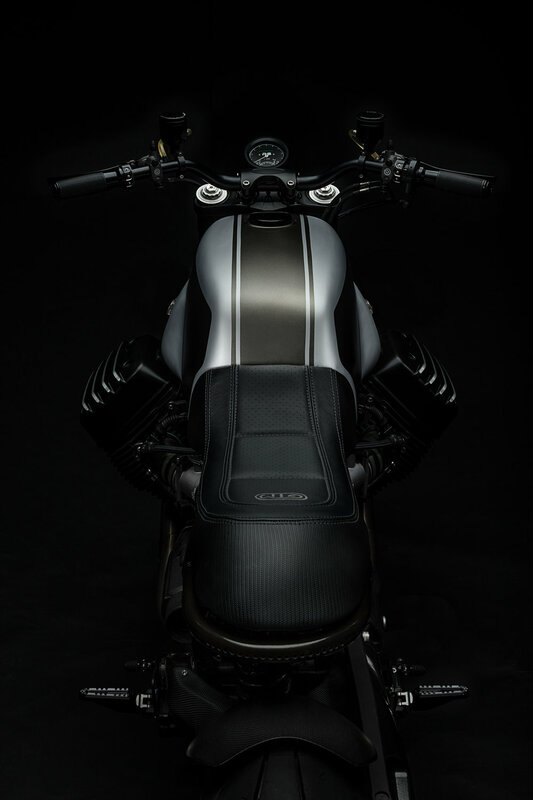 A performance upgraded clutch drives through the 6-speed gearbox via the robust and responsive Moto Guzzi CARC (Cardano Reattivo Compatto) shaft-drive. 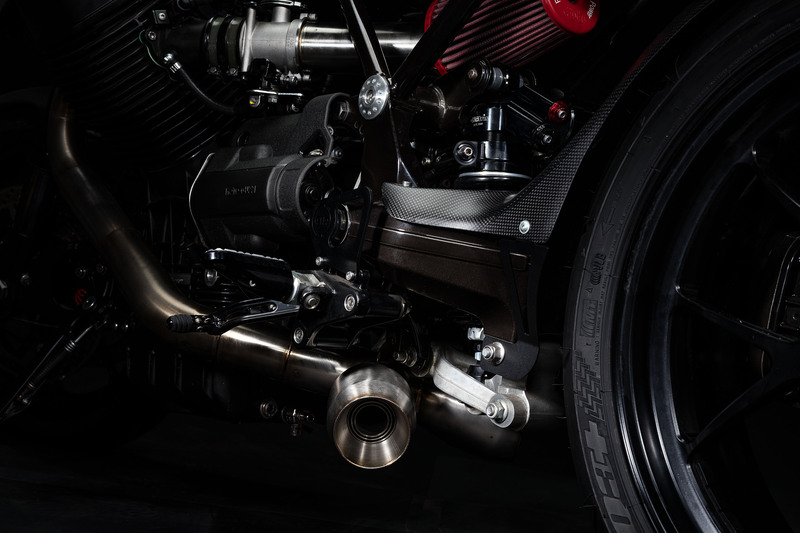 Proprietary fuel mapping enables riders an undeniable connection with the iconic engine across the rev range, providing smooth and even thrust. Confidence and control in every corner, no matter the speed. The GTM-01 front end features an utlra-rare Marzocchi 50mm RAC Factory Works fork, with the rear managed by a precision-crafted Matris R Dark monoshock. The GTM-01 rolls on superlight Marchesini forged-aluminum wheels with Dunlop Qualifier Q3+ tires for sure-footing confidence that would tame even the winding roads outside of Mandello Del Lario. The exhaust is a GTM in house designed and built “X-Fire” system . It maximizes performance without excess weight. The headers intersect in a cross muffler system that is both a balance pipe and structural member, reducing weight and complexity. “I’m not out to make motorcycle art. GT MotoCycles are built to be ridden. These aren’t for everyone, and that is sort of the point I guess. I’m confident that experienced riders will be smiling after firing it up, and that’s before the real fun begins when you let the clutch out!” says Mr. Eagan. While only a solitary GTM-01 will be seen carving corners, the subsequent GTM-02 series bespoke production motorcycle is available starting at $20,000, plus the donor motorcycle. 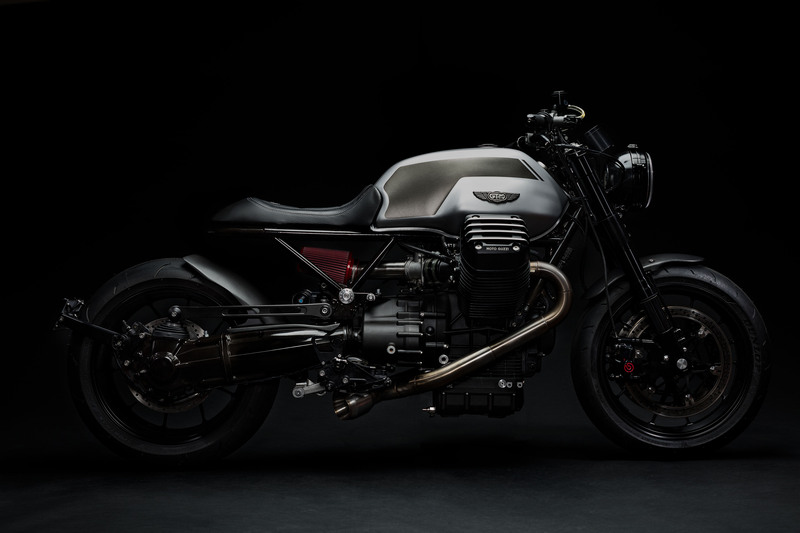 Any modern CARC- equipped Moto Guzzi can be used as a donor unit, with the end result carrying the same VIN, so there are no problems in registration in any state. The resulting GTM-02 will be tailored to the the customers desires, budget and the imagination of the GTM team. “The GTM-02 is the opportunity to work with individual enthusiasts who want an ideal blend of form, function, power, and customization. We can use as many stock components to keep the build cost down, or really dig in and build all the way up to a turn-key supercharged version with top-shelf running gear. Our commitment is to customer service, and building the GTM of their dreams”, says Eagan. 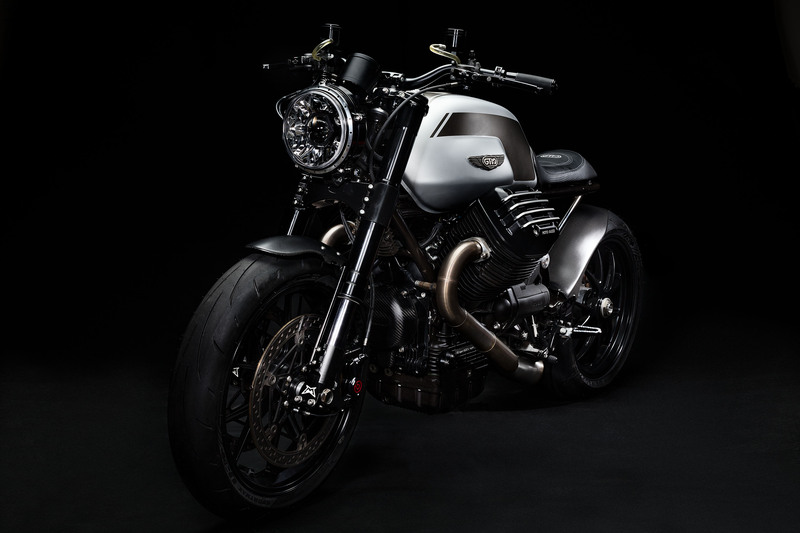 The first GTM-02 series is currently in the raw (unpainted but mechanically complete), and is based on a Moto Guzzi Griso 1200-8V. Unique features include GTM’s proprietary trellis frame, a 1380cc supercharged engine with 200+ rear-wheel horsepower, and a long list of top shelf components that will stimulate every rider’s emotions. The first GTM-02 will certainly be the first of many bespoke custom American / Italian beauties tackling the road unlike any other motorcycle built today. 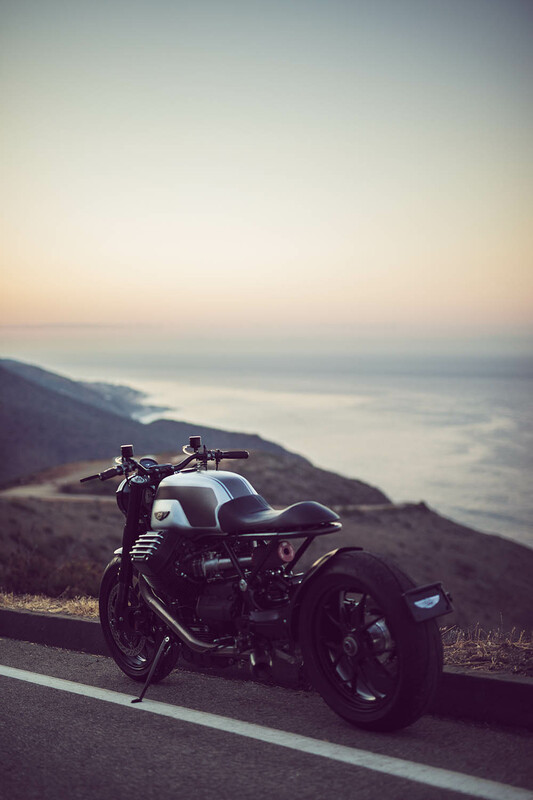 GT MotoCycles is the sister company and custom motorcycle division of GuzziTech LLC, headquartered in Malibu California, with its fabrication shop in Orange, California.